Posted November 2, 2010 by Tom Thumb. The Indian guru comes to embrace the world but even she can’t put back together the pieces of a broken heart. The skating rink was ablaze with lights, incense in the air and the sound of bhajans drenched our ears. The ice was covered with carpets and devotees kneeled down in the direction of the Divine Mother, MÄtÄ AmritanandamayÄ« Devi, otherwise known as Amma of Kerala. We were, however, in Milan and if there’s one thing that Italians do well it’s being Indian. In fact, going by the immaculate saris, coral malas and henna make-up, it’s fair to say they do it considerably better than the Indians do. Even when it comes to traditional Hindu devotional worship, Italians do it better. Amma, representing the Maternal aspect of the Divine, also fitted nicely into the Italian mindset where the concept of a sacred mother is no stranger. It was only a short jump, after all, from venerating Maria to prostrating themselves before this woman who has brought some 6 million people to bear on her shoulder. Almost 1% of the world’s population. 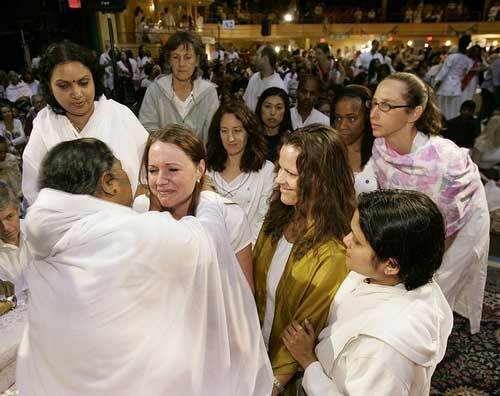 Amma is the hugging guru. With an ashram in Kerala, India, as her base, she tours the globe and hugs thousands of people each day on tour. She has a large faithful who rent huge venues for her next gig and word of mouth publicity guarantees her a large crowd. Kitchens are set up serving delicious Indian food and a mini-market selling Amma merchandise helps fill the coffers. Although couched in terms of Hindu philosophy, Amma is open to all faiths and people of all backgrounds come to receive her darshan, many experiencing acts of healing, revelation or just the profound sensation of being near a Mahatma, a great being. But that wasn’t my reason for being there. 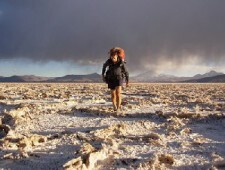 I was chasing a beautiful Japanese girl who I’d met the year before in a Rainbow gathering. We’d had a sweet, if brief, romance but she had an Italian boyfriend somewhere and, besides, she was flying to Australia a week later. I’d already been to Oz that year and there didn’t seem any realistic way to follow her. We stayed in touch, though and I nearly flew out to meet her in Bali in the spring before she decided to give it another go with her boyfriend. She had now recently returned to Italy to be with him but it seemed things weren’t going so well. An exchange of flirtatious emails later and I was on a plane to Milan, hoping to win her over. The background for our reunion was the queue of thousands waiting to be hugged by Amma and the recorded speeches explaining where all the money went. Hospitals in India, orphanages and the poor all benefited from Amma’s extensive social program. The announcements had a captive audience as everyone waited patiently for their turn, clutching their tickets with their number on them. I was interested in hugging only one person, however and throughout the evening I held Yuni close to me, whispering in her ear of the great things we could do together. She was confused about her situation and though she was determined not to betray her boyfriend, I could feel her opening up in my arms. She had also been traveling for the last 10 years and now wanted to settle down, make a home and maybe have children. She was so beautiful, such a unique spirit that I felt ready to give her whatever she wanted. Our turn came to hug Amma. We shuffled forwards in the queue and were instructed by Amma’s attendants as to how to behave. We were to approach on our knees, allow ourselves to be handled, we were to rest our head on Amma’s shoulder and on no account try to touch her. We knelt on the carpets and the atmosphere grew more charged with each inch that we crawled forwards. The bodies were dense around us as the people in front took their turn and the attendants closed tightly around us.. Suddenly a gap cleared and Amma was sat before me, a short, chubby woman towards whom I was gently pushed. I was pulled down onto her shoulder and immediately was she was whispering something unintelligible in my ear. The lights were bright around me and I could smell the stifling sweat of human bodies. Then it was over and I stumbled away, not quite sure what had just happened. Yuni received her turn and left from the opposite side, taking her seat near the faithful who meditated on the floor. I, meanwhile, had the strange sense of having been violated and I fell quiet to see if anything had changed inside. In any case, our host wanted to go and I had to go and rouse Yuni from where she knelt with her eyes closed, a few metres away from the action. We walked back to the Milan apartment, not talking much and I knew she had decided. Before we went to bed she expressed there was no way she could leave her boyfriend right now and even if she did, it wouldn’t be right for her to just jump ship and come over to me. I couldn’t blame her. I knew she was doing the honest thing and had only encouraged me to come and see her in a weak moment. I’d promised to come with no expectations and I was only angry with myself for letting my hopes get so high. How could a woman whose heart was still full of someone else find room for me? I accompanied her to the train station and remained silent all the way. I kissed her on the forehead and walked away. It was too cold to be outside and so I wandered through the Amma show in a daze, the smiling faces under the bright lights part of some strange hallucination. The stalls full of merchandise seemed a strange joke with Amma books, Amma CD’s, Amma cups, Amma car stickers, Amma dolls, malas worn by Amma, posters of Amma in various poses, even some of her face superimposed onto that of a Hindu deity with 4 arms. It was all too strange and sad to be true. The only hug I wanted couldn’t be mine and there was nothing else to do but pick up my bags, the broken pieces of my heart and move on to put them back together again somewhere further down the road.